Late into the first quarter of the 21st century, the Fed is still in the Dark Age! …For example, the medians of the most recent projections from FOMC participants and the Survey of Professional Forecasters, as well as the most recent Congressional Budget Office (CBO) forecast, all have the unemployment rate remaining below 4 percent through the end of 2020, with inflation staying very near 2 percent over the same period. From the standpoint of our dual mandate, this is a remarkably positive outlook. Indeed, I was asked at last week’s press conference whether these forecasts are too good to be true–a reasonable question! Since 1950, the U.S. economy has experienced periods of low, stable inflation and periods of very low unemployment, but never both for such an extended time as is seen in these forecasts. Standard economic thinking has long offered an explanation for this: If unemployment were to remain this low for this long, employers would be pushing up wages as they compete for scarce workers, and rising labor costs would feed into more‑rapid price inflation faced by consumers. This dynamic between unemployment and inflation is known as a Phillips curve relationship, and at times it can pose a fundamental tension between the two sides of the Fed’s mandate to promote maximum employment and price stability. Recent low inflation and unemployment have some analysts asking, “Is the Phillips curve dead?”3 Others argue that the Phillips curve still lurks in the background and could reemerge at any time to exact revenge for low unemployment in the form of high inflation. Let us start with a look at the modern history of jobs and inflation in the United States. Figure 1 shows headline inflation and unemployment from 1960 to today and extended through 2020 using the average of median projections from both FOMC participants and the Survey of Professional Forecasters, and the CBO projections. As the figure makes clear, a multiyear period with unemployment below 4 percent and stable inflation would, if realized, be unique in modern U.S. data. To understand the basis for these forecasts, it is useful to contrast two very different periods included in figure 1: From 1960 to 1985, and the period from 1995 to today. The first period includes the Great Inflation, and the latter includes both the Great Moderation and the distinctly immoderate period of the Global Financial Crisis and its aftermath. There is a dramatic difference in the unemployment-inflation relationship across these two periods. During the Great Inflation, unemployment fluctuated between roughly 4 percent and 10 percent, and inflation moved over a similar range. In the recent period, the unemployment rate also fluctuated between roughly 4 percent and 10 percent, but inflation has been relatively tame, averaging 1.7 percent and never declining below 1 percent or rising to 2.5 percent. Even during the financial crisis, core inflation barely budged. Notice that, in each period, there is only one episode in which unemployment drops below 4 percent. In the late 1960s, unemployment remained at or below 4 percent for four years, and during that time inflation rose steadily from under 2 percent to almost 5 percent. By contrast, the late 1990s episode of below-4-percent unemployment was quite brief, and during the episode and surrounding quarters, inflation was reasonably stable and remained below 2 percent. It seems 4% unemployment is a lower bound that, if crossed, will push inflation up. Many appear to forget that inflation is not an “unemployment phenomenon”, but a monetary one. My first chart illustrates. When unemployment fell below 4% in the mid-1960s for a period of time inflation picked up, just as Powell reminds us. 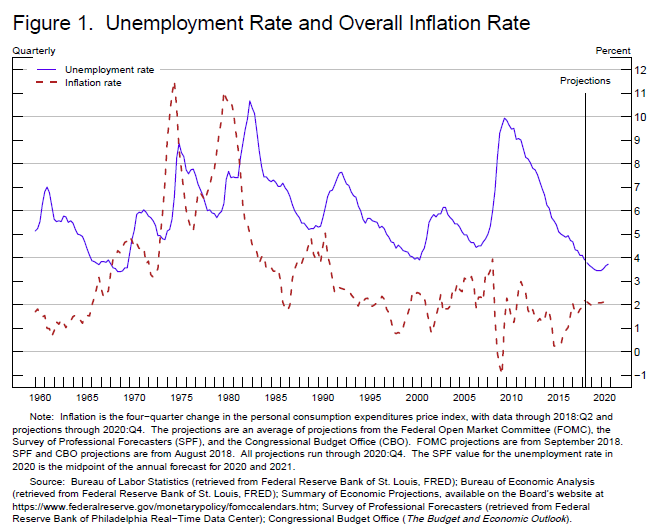 Note that soon after “confirming” the Phillips Curve, inflation falls while unemployment stays relatively constant. That was followed by a period when both inflation and unemployment increase! The second chart, covering the post-1995 period, however, paints a very different picture. The Phillips Curve has “vanished”. The two green bars denote periods when unemployment rises, even significantly, and inflation barely moves. What´s going on? What is more likely, in my view, is that many factors, including better conduct of monetary policy over the past few decades, have greatly reduced, but not eliminated, the effects that tight labor markets have on inflation. He should have concentrated on the better monetary policy argument, and skipped the connection with “the effects that tight labor markets have on inflation”. In the 1995 – 2018 window, inflation remains low & stable because monetary policy was, from the start of the “Great Moderation” and until 2007, providing nominal stability. That was broken with the “great monetary error” of 2008. Later, the Fed restored a lower level of nominal stability. Inflation expectations, after falling in 2008-09, were anchored again. However, it´s now a “different” economy. The next chart, an elaboration on the inflation & unemployment chart for the 1995 – 2018 window, allows me to solve the ‘puzzle” associated with the green bars when unemployment rises without any significant move in inflation. Once you add nominal spending (NGDP) growth to the chart, the reason for the increase in unemployment becomes clear. In those instances, monetary policy tightened, gauged by the drop in NGDP growth below trend. In 2008, this drop was “immoral”, leading to an also “immoral” rise in unemployment. Even during the brief and timid NGDP slowdown in 2015-16, unemployment stopped falling, resuming the downtrend when NGDP growth picked up again. Why didn´t inflation tank in 2008? The answer appeals to the fact that inflation expectations were well anchored, i.e. the Fed enjoyed high credibility as an inflation targeter. Bottom Line: Although persistent breaches of the 4% lower bound for unemployment are very rare (in fact, it occurred only once, in the late 1960s), who can say what would have transpired after the late 1990s if the Fed hadn´t tightened by allowing nominal spending growth to drop. If Powell and the Fed feel that the Phillips Curve is a “good guide” for monetary policy, given the low present and forecasted unemployment mistakes will likely happen. It´s not encouraging, therefore, to hear Powell say on Tuesday “monetary policy is not tight” and on Wednesday “We´re a long way from neutral, probably”. Keep your eyes on NGDP growth. If it falls, unemployment will rise, while inflation remains tame. If it begins a rising trend, unemployment will drop faster, but inflation should, if the rise becomes persistent, increase. That´s however, no Phillips Curve! Many economists think the Phillips Curve is the relationship between wage growth and unemployment. If so, then the Phillips Curve may be true as it is the relationship between the biggest part of version of NGDP, labour income, and unemployment – as you seem to say.